Been working on filling my Etsy store and putting the website behind me. After researching and not finding anyone using the domain I was going to use, I had bought a domain. Was not happy with the host so I changed and when I changed hosts I was doing more research and found a blog with nine posts with the name I had bought. I could just not get the one host to give me the information to move the domain to the new host and at that point, I just said enough. I had changed Etsy to the new name, but explained the circumstances and they let me go back to the Stephies beads baubles one. 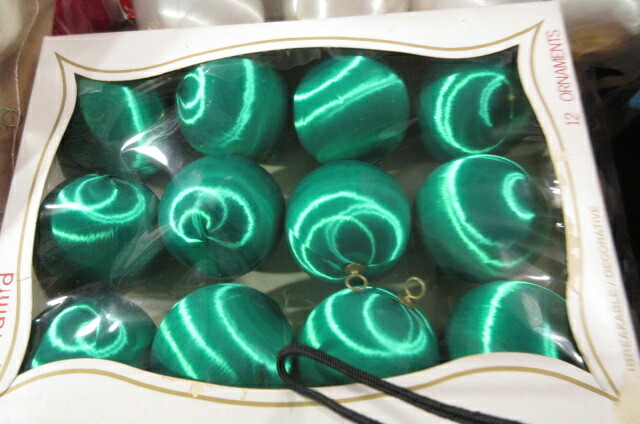 So, had decided to sell kits to make the old vintage satin beaded ornaments. 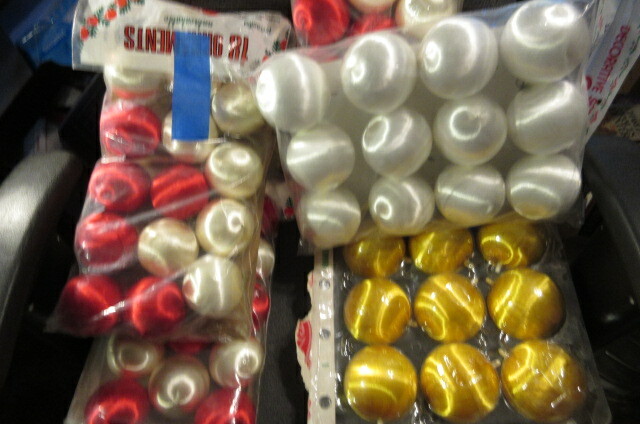 I spent a lot of money on Ebay and Etsy buying vintage satin balls in various colors. 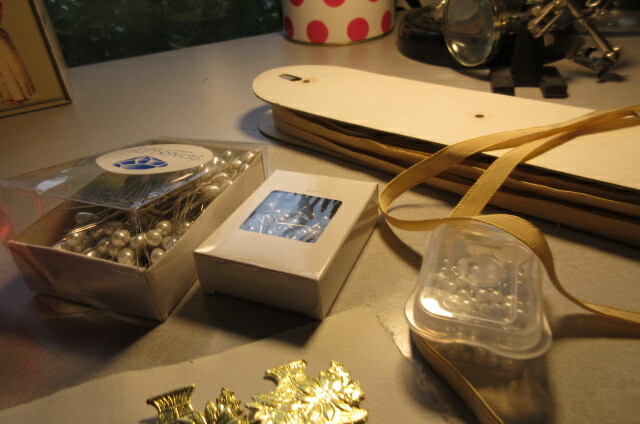 Collected all the things I would need to make some pretty balls, to then make kits to sell . 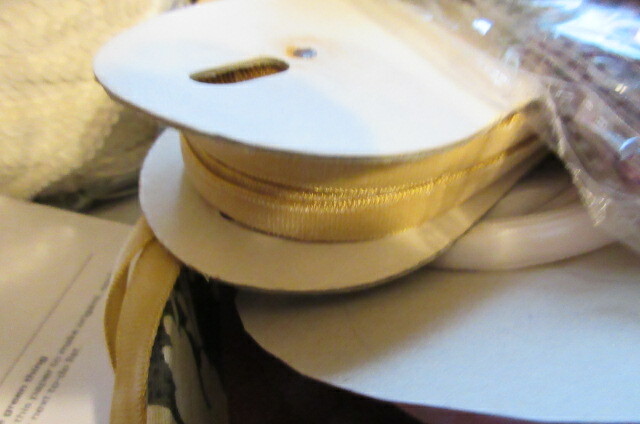 Pins, sequins, beads, metallic gold seals, ribbon. 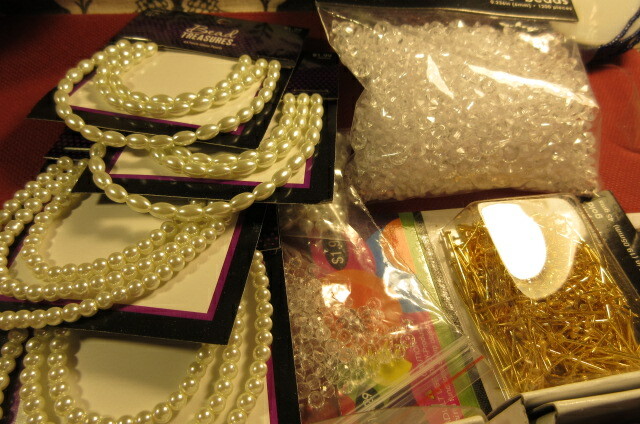 pretty glass pearls I got on sale for half price, so a dollar a package, and clear plastic rhondelles from Hobby Lobby, also much cheaper than any I found online. so many pretty boutoniere pins from Ebay. 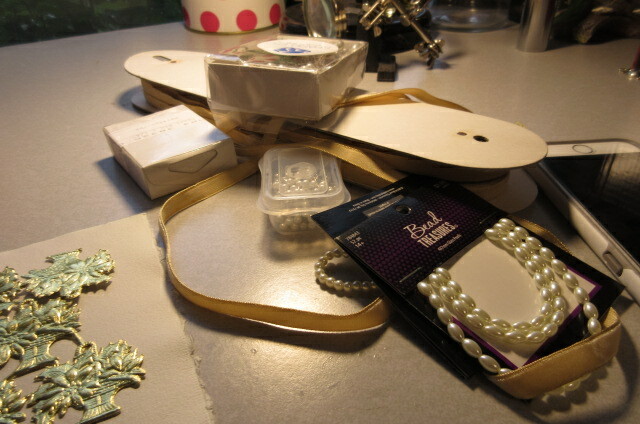 Lots of pretty pearls and love the rhinestone ones too. Plastic but cute !! 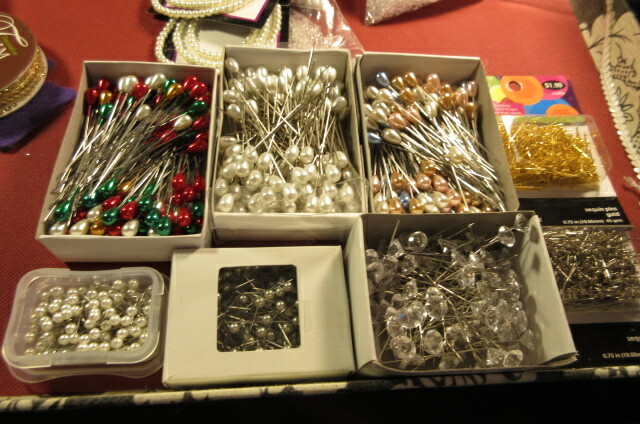 Very good prices and then the plain pins and the small plastic box of pearl , short pins, are also from Hobby Lobby. most of these are the 2 and a half inch, just one package is the 3 inch I really wanted and are almost impossible to find in styrofoam, most are in the hard plastic, which I cannot push pins through. 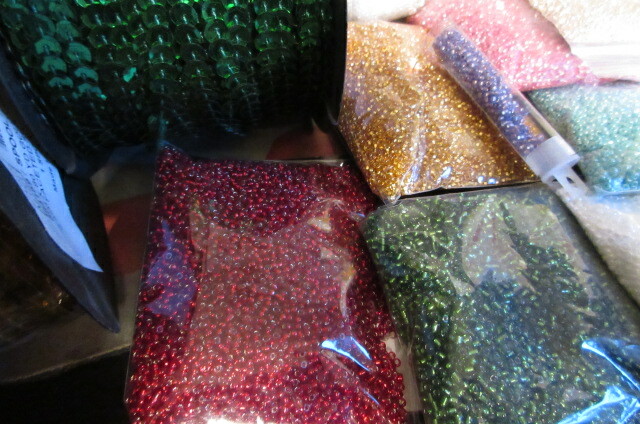 Just the seed beads I had purchased in bulk , most of them previously , a drop in the bucket of all my seed beads, I have so many !!! Some purchased bulk in small individual packages and some in bulk bags. That is when reality hit me. I have no talent at all with this project. 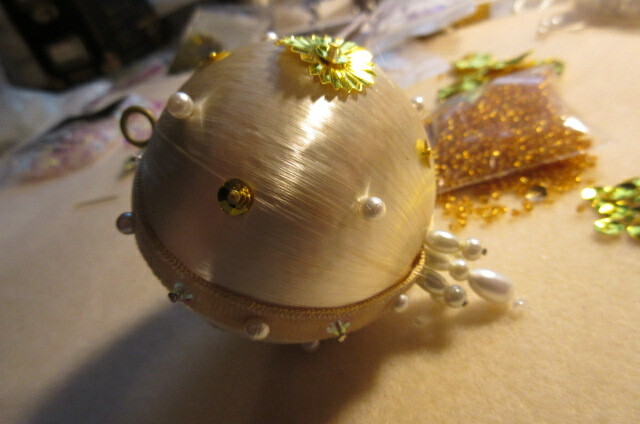 I can make beautiful beaded and sequined ornaments on felt, and use seed beads to make lovely earrings and necklaces, but this odd round satin ball , along with using pins that are too thick for most of the seed beads, it was a hot mess. 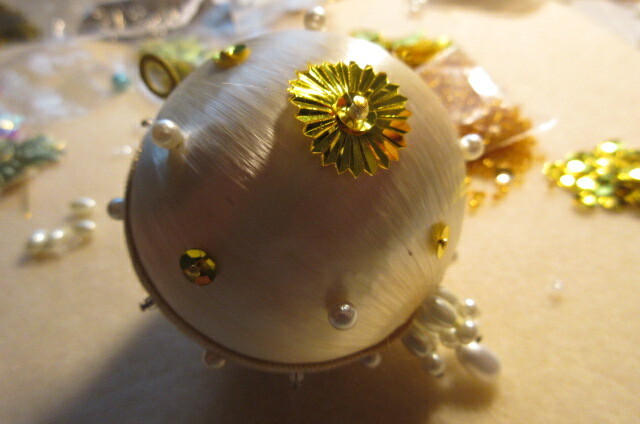 Now, no doubt I could keep at it until I get better, but I cannot sell the satin balls in kits if they are full of holes, so I can only do a few and second of all, I hated doing it. Really hated it. 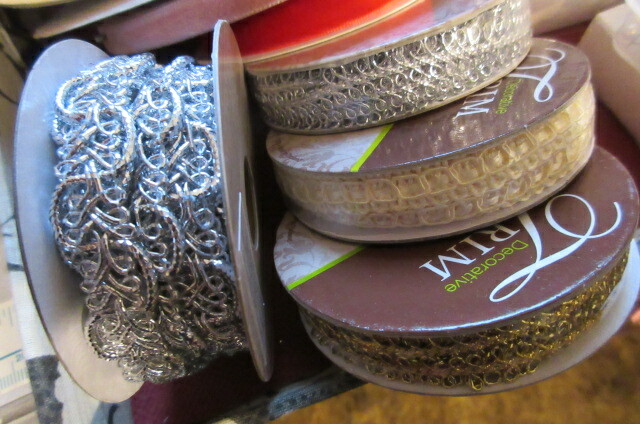 Was shocked by that realization as I love to sew with seed beads and sequins. 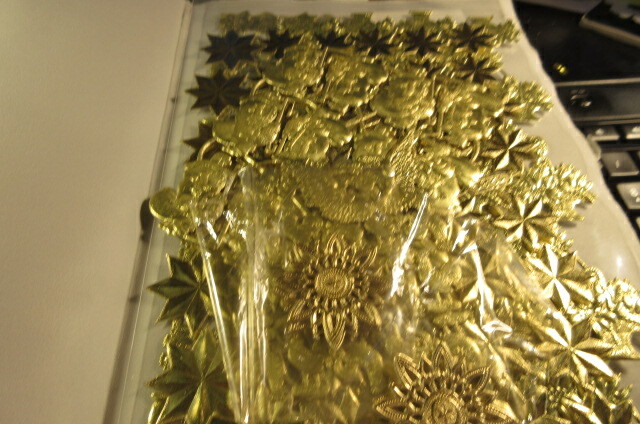 first I tried a gold seal, a basket of poinsettias, did not like how it looked at all. Knew it would snag at first chance but to put enough pins in to insure it would not snag, would look horrid. 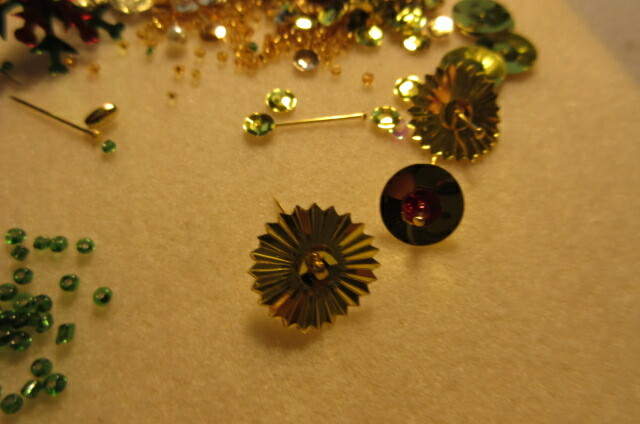 So, plan two, vintage sunburst style gold sequins. Eh. Not sure about that either, but that one is still made up. 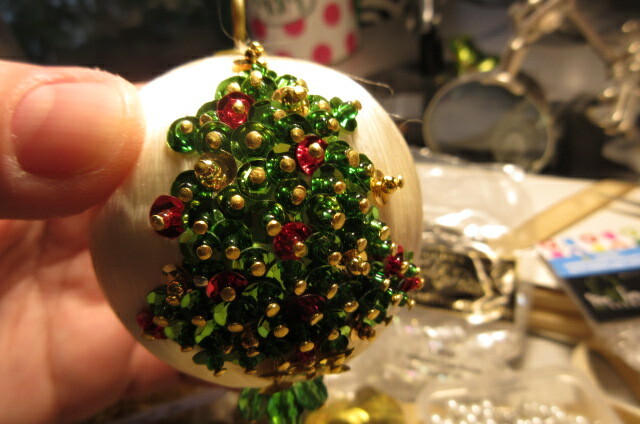 So, having looked at pinterest, which is an insane thing to do when you already feel like you do not know what you are doing, I decided to do something like one of my beaded felt ornaments, oh. my. gosh. No. Not fun like sewing is. Looks awful. Hated it. Every. Single. Minute. It does not look bad per se, but it looks bad. Pins put in sideways instead of straight, not balanced, not at all. I am used to using the felt cut out as the guideline, so it is always straight because I fill it in. I do not have to try, it is easy. This was horrid. Not fun at all. Put some layered sequins on the back but never even took a picture, hated it. Here is what I used. 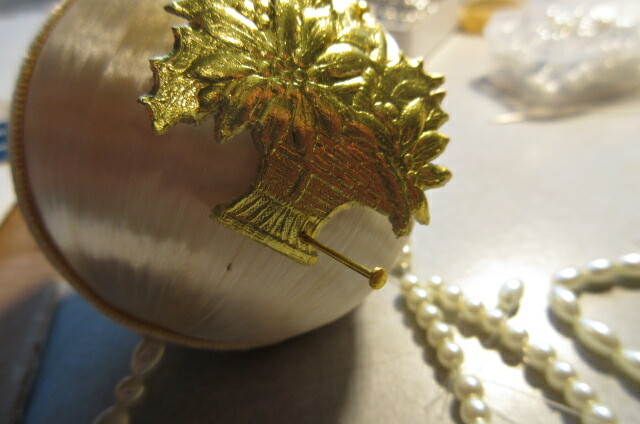 Top is a sunburst vintage sequins with the same color gold vintage slightly cupped sequins on top of it, and then a round gold bead, also vintage from when I bought them back in the early 80’s to keep the pin from going through both sequins. 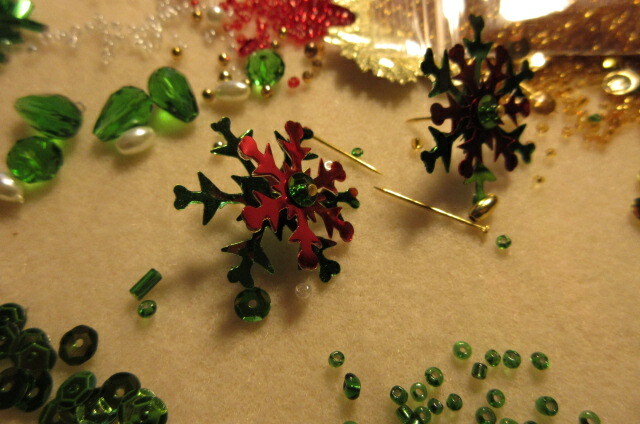 I also used some huge 12 mm gold sequins with slightly cupped red sequins on top, with a red seed bead. I love the look and will use both on a sewn ornament, but the snowflakes are big and did not lie flat on the round ornament and just looked awful. 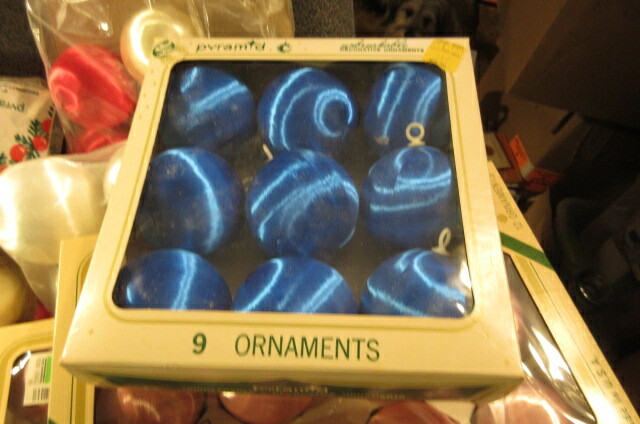 my new idea, confess in the listing what happened, and just sell a bunch of seeds, sequins , pins and a satin ball, all done in colors , like a blue set, pink set, gold set, white set, and red set, let others figure out what to do. Seems like the best way to go at this point. So, that is where it stands. I am off to set up those kits and see what happens next !!! ha ! ← Fun new project !!! I am so sorry, I know how hard it is when we hit a brick wall with our creative plans. You do have the talent and with all those beautiful items, I think you can probably find your market with kits. I’m intrigued with the “pin issue”. Can you use a different type of pin? 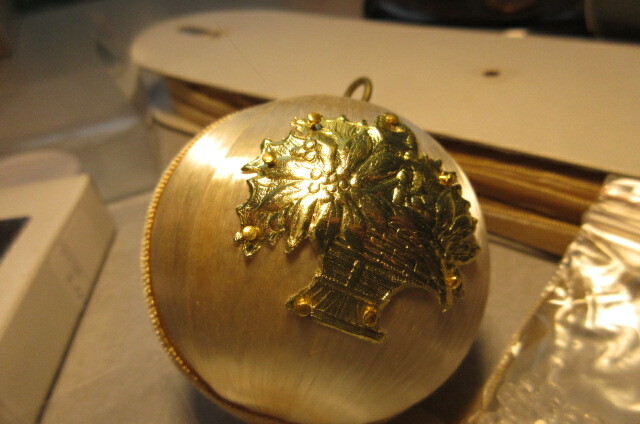 I know nothing about making ornaments, I so wish I could help. Hang in there, it will come together. Sometimes we have to fail to get to our next big win. Thanks for your kind words ! !I really appreciate it, a good pep talk never hurts and I am home alone dealing with it today !!! I am not sure if they sell thinner pins, these pins were the ones for sale with the sequins at the craft store, so they are meant for that use. 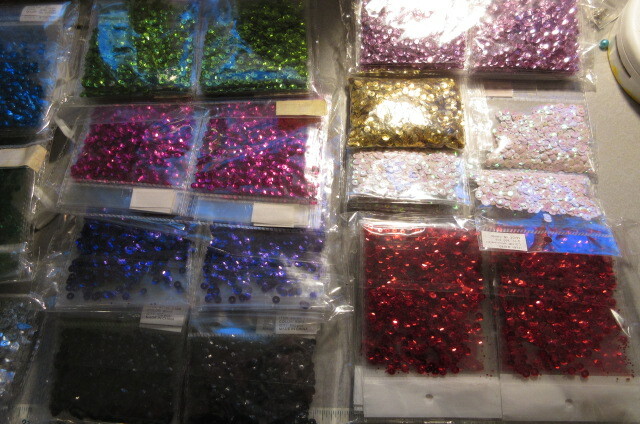 Good news is, the heads are pretty big so on most of the sequins, you really do not have to have a bead. I just like how a bead looks. 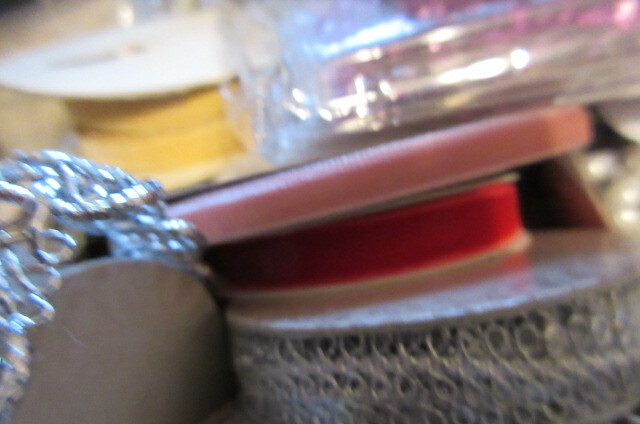 I found some silver lined clear that seems like more fit than do not, so I am going to use those. I made up one kit, no instructions, just stuff in a box, a nice variety and we will see how that goes. 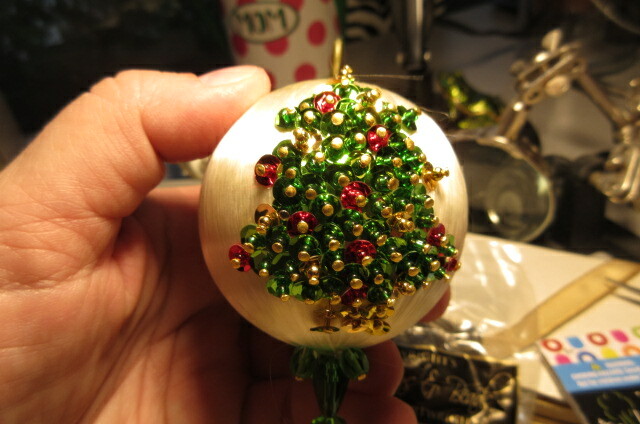 I will do other colors but started with a red satin ball. I also made up some sequin sets as well with my vintage sequins. 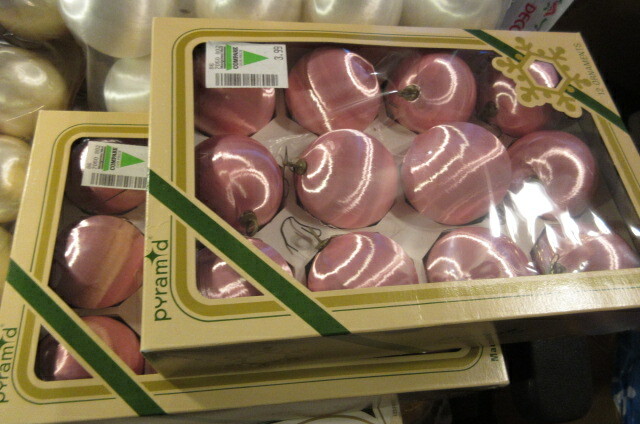 I am about to list those four sets and the one satin ball ornament kit. I guess we will see how it goes !! Tomorrow I will make up a blue kit , a pink kit, and a white kit. 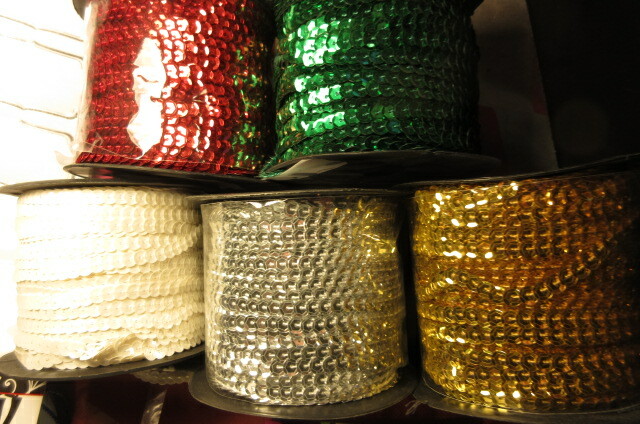 I have whites in small and large and some golds in medium and tiny. So, I have a bunch of options and will see how it goes !! Just a change in how I am doing things !!! Hi, I don’t work with sequins myself so I can’t really comment on the technical details of your problem. I love gemstone beads and have been making jewellery all year. I have to re-open my old Etsy store and start uploading them soon. Reading about your trials with your creative processes and with online selling is refreshing. I go through these kinds of problems too. Sometimes I think the old folding table at the local market is the way to go but then these days, over here in Oz, you pretty much need a gazebo and all kinds of display techniques to attract customers. Good luck with it all. I hope you find the techniques which flow for you. Hi Suzanne !! t hanks so much for stopping by and leaving a comment. It is nice to know that other creative people struggle too and we all have that in common , it helps a lot ! !It is nice to know I am not alone in that !! I probably should have stayed with what I loved, working with the seed beads and sequins, but felt I should make stuff that would sell better and that is always the kiss of death, to not do what you really love to do and do something else to sell more. 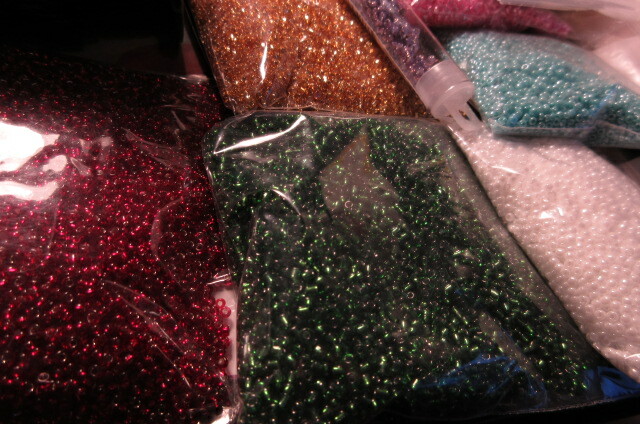 So, I will sell off most of my beads and charms, keeping the few favorites and keep ALL my seed beads and sequins, which is a lot, but they are small , lol, and start working on what I really love. 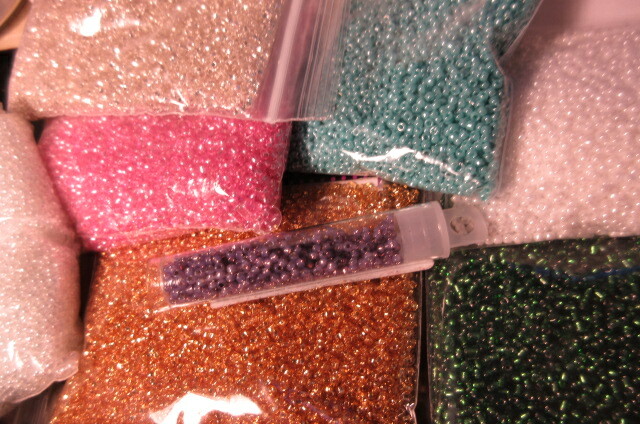 Funny thing is, I LOVE the beads, any beads, but just prefer working with those tiny seed beads !! I miss doing the craft shows. That was the most fun times I have had. I loved being out among the people and meeting others and seeing what other crafters and artists have made, but in the past ten years, at least here in the Dallas area of Texas, they have gotten so pricey , 100 bucks and up , it is not worth it for me to do that any longer. Also, I agree, you really need to have all the displays and tables and , as you said, things to attract customers !! You also need a partner to give you breaks when needed, and I just do not have that person to help me. My husband would, but works every other weekend, and sometimes overtime the other Saturdays, so I cannot depend on his help, he is only available some of the time. So, I think we all have to find what we love doing the most, concentrate on that and then find a way to make it work. I honestly think that is the secret to success in any art form. You just have to love what you are creating !! 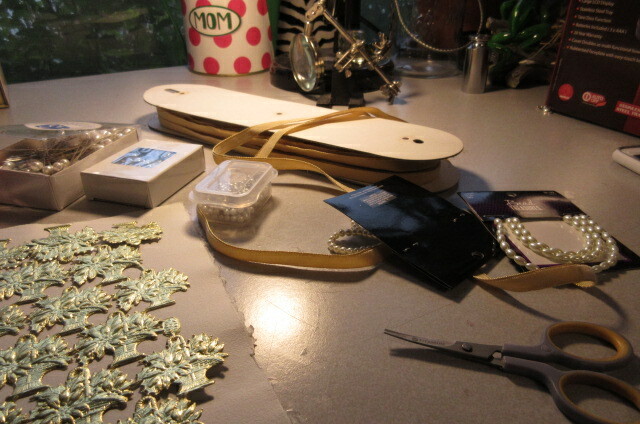 It sounds like you love making jewelry !! I hope you will get back to it, and enjoy it !! I think creating always makes us feel better !! I wish you the best of luck , please share your Etsy store name when you have it up and running, I am happy for it to be in the comments here for others to see !! I would love to check it out !!! Sounds like the last three months of my life. You’re definetly not alone. Hang in there. Thanks so much for your support !! It is funny how we can think we are the only one going through something. I checked out your page and really enjoyed it. I wish when our kids were growing up and I was a stay at home mom, I could have had the internet . I would have had so many opportunities that were just not available in those days !! Computers did not come along until our kids were a bit older and then blogs were not even a thing back then. I love seeing all the creative moms and grandmas too, the world is so much more interesting these days !! !